It is finally starting to feel like winter in California. In celebration of the season that embraces warm jackets, snuggling and hearty meals, I will be posting some of my favorite soups in the weeks to come. One of my favorites is Lebanese Vegetable Soup: hearty vegetables and chickpeas floating in a medium-spiced tomato broth. The best part about this soup for me is the chickpeas. They really round out the dish and add much needed protein. Chickpeas, also called Garbanzo Beans, are a great source of cholesterol-lowering fiber. This makes them an important food for those with diabetes, insulin resistance or hypoglycemia. Chickpeas are an excellent source of the trace mineral, molybdenum, which is an excellent detoxifier. Like most legumes, chickpeas are excellent at lowering cholesterol, decreasing the risk of heart disease and providing energy. Chickpeas are also a great source of iron, phosphorus and manganese. Topping off the completed soup with some yogurt ensures a complete protein in this meal and helps aid digestion. Heat olive oil over medium heat in a large soup pot and add chopped onions, carrots, celery and garlic. Cook for 8-10 minutes. Add coriander, bay leaf and cayenne and stir to coat vegetables. Add potatoes, tomatoes (and their liquid if you are using canned tomatoes), broth and 2 pinches of sea salt. Bring soup to a boil, cover, reduce heat to simmer and cook for 10 minutes.Add chickpeas and cook soup until potatoes are tender, about 5 more minutes. Add artichoke pieces, and simmer for 3 minutes so the flavors can meld. Season with sea salt and pepper to taste and remove bay leaf before serving. Serve garnished with yogurt, chopped parsley and lemon. I love this! The artichoke in the soup is really interesting. I love soups and chickpeas. Even if the weather is not too cool, I still have soups during the cooler part of the day which is dinner. I love artichokes too. Winter in California? I thought that was a myth! 😀 Love this soup, esp your usage of artichokes with the chickpeas! I usually see a lot of lentil soup lately so this is a welcome change! Yogurt is a nice touch too! What an interesting soup, I love every component! Seems like the perfect healthy comfort food. Yummy! This sounds and looks really delicious! Yum! You've inspired me to try chickpeas! I love to make soup, so this will be a great new addition to my regular soup rotation. All these nice beautiful food to look at when Im starving. No food in the office. Looks so good and I love artichoke am sure I will like this. Lebanese food? Something different from what I usually have. Cool! Thks for sharing! I never had the opportunity to try Lebanese cuisine but this soup looks divine! Love chickpeas and this looks like perfect cold weather comfort food! I like the addition of the artichoke hearts! This is one of my favorite types of soups! 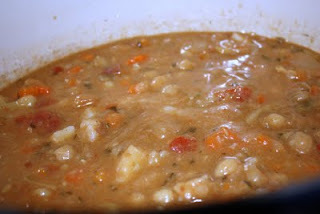 This soup looks awesome – I'm going to make it tomorrow! But I wonder….could suggest an alternative to artichoke hearts? This looks wonderful! Ya know, everyone seems to add yogurt to their soup but I've never actually tried it. Next time I remember – I'll throw some Greek yogurt in and see how it tastes- it seems like the perfect combo! It is definitely soup season here in NY, although the weather is warmer this week. This soup looks so tasty and i love the idea of adding yogurt! What a delicious wonderful soup! I love the addition of artichokes here! Yum, just reading through the post and the recipe ingredients, I can just taste this soup!! What a great way to enjoy veggies and stay cozy-warm on a chilly night! This sounds fantastic and so hearty. We've been craving Middle Eastern food almost every night since it got cooler (well, the Houston version of cool which means it's been in the 80's). We've got to work you soup into our repertoire. Oh yum! I love Lebanese food. This looks like it's packed full of flavour… and it's so healthy! With this I can dig into something really tasty without worrying about any calories! Great recipe! I've taken Lebanese bread but not Lebanese soup before! Looks so inviting. Should try it out some day. Thanks. Just finished a big bowl of this and it rocked! Thanks for the great recipe. I even used the artichokes. Loved the flavors! I am from Lebanon but I confess I have never had this soup before. It looks great and like all Lebanese dishes is very healthy!